We’d like to give a big and heartfelt thank you to everyone who cast their ballot this year for Total Tech. This is our ninth year as Oakville’s preferred pool and pool services company, and we couldn’t be happier or more proud. The Readers’ Choice Awards are always people-driven distinctions. 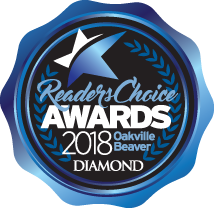 Each year, real readers and customers select and vote for the businesses and individuals of their choice in recognition of the services and products they provide, making nominees and winners true leaders in the community. These types of awards are so important to everyone at Total Tech because they come from the judges whose opinions we value the most: the clients we’ve worked with year over year to provide trusted, proven, and expert pool services. In addition to maintaining the highest standards of quality service and technical knowledge, we’re committed to remaining active members in the communities in which we live and work. We continue to be involved in and support local organizations like the Oakville and Milton Humane Society and Swim to Survive Lifesaving Society. From all of us at Total Tech, thank you for your continued support. With our newly expanded and renovated store, we look forward to providing the best service and selection for many years to come! Total Tech Pools delivers comprehensive, quality pool services to customers in Oakville, Burlington, Mississauga, and surrounding areas including all types of repairs, restoration, and maintenance. Contact us today to discuss your pool service needs! Safety Cover Sale: Book Before September 30th and Save 10% Plus a Free Pool Closing!